Who ever played to a game called Dark Cloud? 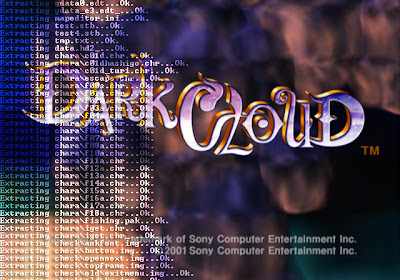 It was my first game for PS2 and I remember that I found it on a demo-disc. Recently I saw a video that show the beta version of this game, much different from the final version, so I developed an unpacker for this game to see if some old data was keep (and yes, I founded some "old" data) that I want to share. The files required to use the unpacker are data.dat and data.hd2, and you can get them from the disk/iso. I found a lot of models (in MDS format), another data.hd2 that seems to point an old version of the game, gdata_e3.edt_ that seem a file from the E3 demo, some test files and a setting file from the Map Editor of the game! We can found also some scripts, for example I found the scripts of the boss in export\dun with .cfg extension. Other scripts are located to export\dun\cloth with .clo extension. Also in each folder of export\gedit we can found a lot of scripts in .cfg format, like mapinfo.cfg and sound.cfg. A lot of .img files can be found, a container for TM2 format. Also some files with "_" can be found, like _dunmenu.pak, maybe unused stuff that was left. If someone is interested to the hacking of this game write here, I can give an help :). Oh my gosh this is a literal dream come true ._. My friend and I were obsessed with this game for awhile now and thought how neat it'd be to explore the data. I attempted once but really didn't do much with it, and now you've got an unpacker. Xeeynamo Hey, congratulations on the blog and its projects are great. Can you say me what programmes did you use for translate kh bbs fm into italian? The only issue I have is these tools don't pack the .DAT files back into the iso. I want to edit some monstor names and import some things from the Japanese version for both games. @RoxasXIII: ahahah :) np man! Do you know if Truthkey will translate kh bbs fm into spanish? Pardon me, but this extractor gives me a bunch of files that seem to be empty; I want to ask if this is compatible with NTSC-U. Did you ever find weapon data files within the game?